An aid to clarity of pool water. Dissolving slowly, filter floc tablets release a coagulant to help filter sand hold back the small particles which cause cloudiness. 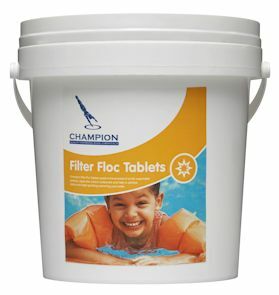 Filter floc tablets are not recommended for use in pools fitted with diatomaceous earth or cartridge type filters. Also should not be used with Zeolite type filter media. Dosage: 2 tablets per 100 cubic metres (1 tablet per 10,000 gallons).